Seeing that there are so many of us; COMMON COOKS that is, I decided to share the things that have helped improve my craft and my enjoyment of cooking. Each month a new article will appear to help you improve your skills and fall in love with cooking all over again. WHY IS BAD SO GOOD? When friends ask me for cooking advice, they usually request I offer a recipe that’s quick and easy. “I can’t do the fancy stuff you do.” They plead. “I just need some step by step instructions and good ingredients!” But in reality, isn’t that’s what we all want? A culinary yellow brick road to food greatness lined with a steel guardrail? But this path of predictability per se, was not built by the gods. It was built by those who understood that the learning curve of cooking, although tedious at times, is not that steep. Seriously, if you do something spectacularly awful with a dish, I promise you will never forget what you did wrong. And, voila! You are now an expert at that technique. And, that is after… Just. One. Try. From there you just begin to build on each technique, until they fit together like Legos and then suddenly, you can create a masterpiece. But when do we have the time to simply experiment? Who has time to come home and see how long it takes for the smoke alarm to go off? I know. Our families are not going to show up for something they’re not sure of. They want it now! But as a cook, you must set the pace. You must cultivate wonderment about food not only in your own mind, but in the mind of those you nourish. We couldn’t walk when we were born, and yet those around us nurtured our curiosities, and celebrated our triumphs. Why can’t we see cooking as the same exciting process of education and joy? So now, what is your first step to invoking the magic? First, stop buying crappy food. It doesn’t smell good, it doesn’t cook right, and it tastes like, well, a word we won’t use here in a food blog post. I’m not talking about having to take out a loan on your home so you can buy $100 a bottle saffron. I’m saying be willing to trade some of that money you spend on other luxurious, say, $20 a week and do a better job of buying fresh meat and veggies, as well as foods that aren’t processed. And pick up a couple of things you’ve never cooked before. That keeps it interesting. Seriously, if you knew how quick and easy a good Bolognese sauce is to make from scratch, you wouldn’t reach for that bottled version as often. Second, invest in at least two good pans (sauté and saucepan) so you can CONTROL the learning process. You can buy high quality cookware at discount outlets, or even places like TJMaxx for so much less than the retail stores. Do it. And the right knives will help you channel your inner Ina Garten, or Rachel Ray, like you can’t believe. Even Mr. Incredible needed a help from his super-costume! Next, I encourage you to spend a little time (I didn’t say hours, I just said a little time…) sidling up next to someone who is good in the kitchen. Yes, the TV shows have so much to offer, but there’s nothing like being in the same room with someone who can say, “Okay, now press on the top of the chicken breast and feel how it bounces back. That means it almost done!” That? That is priceless. Finally, buy a nice big garbage can, a good apron, a roll of super-absorbent paper towels, and get the heck in your own kitchen and start creating some disasters. It is the path to confidence, and skill, and a good meal that you made yourself that no one can ever take from you. And that’s why you, too can have #thepowertonourish! Let me offer you the best part of my knowledge and that is, remember that cooking is series of techniques perfected. If you’re having to call 911 every time you cook, start small. Learn how protein cooks and apply the knowledge. Understand how foods bind together, how sugars caramelize, and how fats emulsify. Your repulsions may be tied to the fact that you’re making the same mistakes over and over again. And I can help you so feel free to email me with any questions! First, a great saute pan. Now, you need a good knife. Click here to download these five simple recipes. Want more main course ideas? We understand. You're a common cook but that doesn't mean you always want common meals! Sometimes you want comfort food, but you want it with a twist so you don’t faint from boredom in the kitchen and at the table. It’s easy to blend something familiar with one or two ‘wow’ ingredients and change everything. Try this classic recipe as a base, and check out these simple variations. Tip: Make sure meat is at room temperature when preparing this. And let the meat loaf rest for 5 to 10 minutes before you cut it into slices. That way it won’t fall apart. Meatloaf is also a wonderful left over. Sandwiches, sing with a slab of cold meatloaf, mayo, catsup and a slice of onion....be still my heart. Like boiling an egg, everyone should know how to make a simple meatloaf. It’s so comforting! Blend all ingredients, place in loaf pan, cover with 3 strips raw, thin bacon if that’s your thing and cook at 375 for about 30 to 45 minutes or until center is at least 180 degrees Fahrenheit. Serve with boiled new potatoes, and your favorite vegetable to quality for true, familiar, comfort food status. With only a few changes, you will be off to Asia in no time. Surround your creation with white sticky rice, and sprinkle a few toasted, slivered almonds on top. Hmmm. I’ve never tried eating meat loaf with chop sticks, but there’s a first for everything! Sriracha sauce to your liking but no more than about a T.
There’s a little more prep to this. Heat some olive oil in a small pan and sweat the onions. Then add the garlic and cook for 3 minutes on a med low heat. Then add the oregano and stir for about a minute or two. If you’re using the bottled marinara, no need to add it to the onion mixture. If you want a bit more authenticity, add 2 finely diced roma tomatoes to the onion mixture and let cook and reduce for about 7 minutes. Add this all to the meat mixture. Spread in pan and cook at 375 degrees for about 40 minutes or until sides bubble and are slightly brown. Serve over spaghetti noodles (or your favorite pasta,) tossed in a little olive oil, fresh rosemary, and some lemon juice. Top with fresh basil. Delizioso! This one is a burst of flavor and each ingredient blends so well with the rest. Sink your teeth into something international and you will never go back to plain meat loaf again. This sweet and savory mixture is a classic blend of several cultures. You’ll be happy to make it your own. Serve this over brown rice, and top with a bit of hoisin sauce cut with a bit of rice wine vinegar and some sugar. Great to serve alongside fresh fruit like cantaloupe, mango, oranges and apples. Take the basic recipe at the top of this list, but add a T or so of brown sugar, and form into balls. Place in a square pan and don’t stack them. Cook for 25 minutes on 375 degrees. Serve over creamy mashed potatoes or tater tots, and then this fun topping. First, combine equal parts grape jelly and tomato catsup in a sauce pan until hot. Place 2 to 3 balls on the top of each mound of mashed potatoes. Ladle the grape glaze over all. Serve with a bit of Italian parsley to garnish if you have grown-ups at the table, too. 5 Easy Vinaigrettes For Killer Salads! Here is a collection of 5 tasty, unique and versatile dressings. The amount of dressing you like to use is up to you but these measurements will dress enough salad for 4 to 6 people. 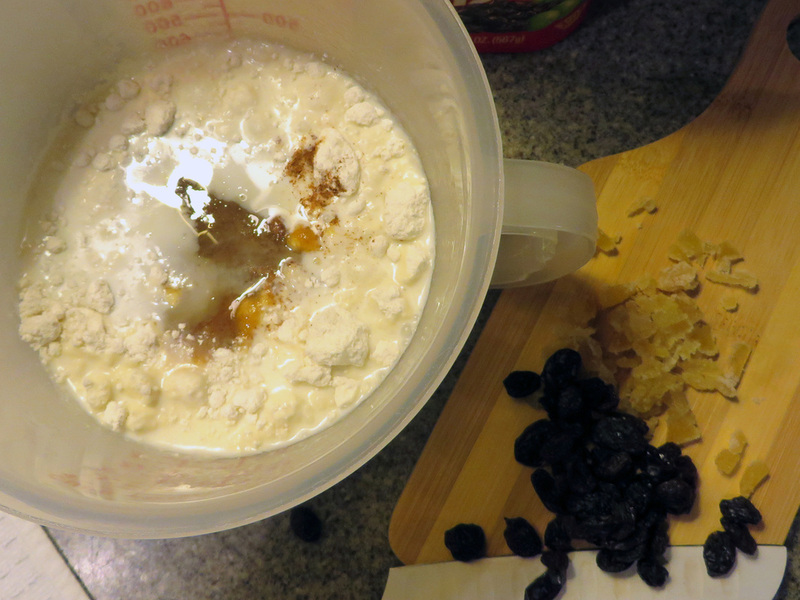 Each is skewed a bit more towards the vinegar and not the oil, so you need to experiment with ratios. I don’t like a heavy dressing but you may prefer that. Also, be sure and use a good whisk. Blending all ingredients is vital to the consistency of the dressing. SALAD: Romaine lettuce, diced red chili peppers, diced red peppers, cashew bits, sautéed chicken. SALAD: Fresh micro greens, radicchio, strawberries, feta cheese, toasted pecans. SALAD: Romaine, spinach mix, diced zucchini, currants or craisins, canned mandarin oranges, peanuts, and a protein like chicken or salmon. SALAD: Coleslaw mix either bagger or your own diced green and red cabbage, blueberries, strawberries, pecans, fresh mint, blue cheese or your favorite pungent cheese. Tired of greens? TRY POURING THIS over fresh roasted chicken, grilled pork chops, or tilapia and rice. You can even cover pasta and then toss with Parmesan cheese. 1. Don’t do other things while you eat. Focus on the flavors, the chewing and the joy of it. Celebrate your mealtime with nice plates, maybe a flower on the table and make time to be grateful for the food and your ability to taste it. Enjoy eating and put that Kindle away! 2. Understand clearly what you’re consuming. Read labels, understand calorie and fat recommendations and do your best to AVOID SUGAR while searching for new flavors to experience. 3. Stop connecting the act of eating with a body that LOOKS good, and connect it to a body that FEELS good. Trust me. The image will take care of itself. 4. Begin your Live-it with acceptance. Don’t start by hating anything about yourself. You can’t begin with your body as a battle ground. Accept every cell, every element of who you are and then move towards change with exuberance and joy. 5. Don’t be afraid to go out to eat. It’s easy to customize your meal. Avoid sauces, dressings, and breads. Embrace double portions of vegetables, enjoy proteins, and of course you can have a bite of dessert as a reward. You’re not a prisoner, you’re just trying to Live-it-Up!!! Must have for EVERY food geek. I loved it! The answers to many kitchen conundrums in one easy-to-use volume, from the author of the acclaimed culinary bible On Food and Cooking. From our foremost expert on the science of cooking, Harold McGee, Keys to Good Cooking is a concise and authoritative guide designed to help home cooks navigate the ever-expanding universe of ingredients, recipes, food safety, and appliances, and arrive at the promised land of a satisfying dish. A work of astounding scholarship and originality, Keys to Good Cooking directly addresses the cook at work in the kitchen and in need of quick and reliable guidance. Cookbooks past and present frequently contradict one another about the best ways to prepare foods, and many contain erroneous information and advice. Keys to Good Cooking distills the modern scientific understanding of cooking and translates it into immediately useful information. Looking at ingredients from the mundane to the exotic, McGee takes you from market to table, teaching, for example, how to spot the most delectable asparagus (choose thick spears); how to best prepare the vegetable (peel, don't snap, the fibrous ends; broiling is one effective cooking method for asparagus and other flat-lying vegetables); and how to present it (coat with butter or oil after cooking to avoid a wrinkled surface). This book will be a requisite countertop resource for all home chefs, as McGee's insights on kitchen safety in particular-reboil refrigerated meat or fish stocks every few days. (They're so perishable that they can spoil even in the refrigerator. ); Don't put ice cubes or frozen gel packs on a burn. (Extreme cold can cause additional skin damage)-will save even the most knowledgeable home chefs from culinary disaster. A companion volume to recipe books, a touchstone that helps cooks spot flawed recipes and make the best of them, Keys to Good Cooking will be of use to cooks of all kinds: to beginners who want to learn the basics, to weekend cooks who want a quick refresher in the basics, and to accomplished cooks who want to rethink a dish from the bottom up. 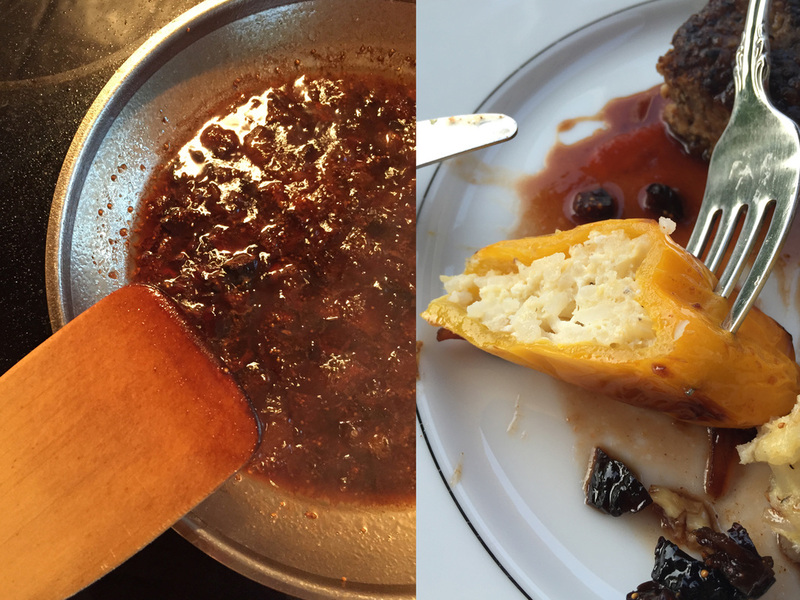 With Keys to Good Cooking McGee has created an essential guide for food lovers everywhere. So many of my friends and family lately have mentioned that they steer away from making artichokes because it seems so formidable. You can understand why, they're spiny, heavy and really, really firm when you buy them. It's like a green pine cone with attitude. Read on to see how easy and fool proof it can be to serve. FOLLOW THIS RECIPE: First, find firm chokes with the leaves mostly closed and green. Visually you can see if it looks like it's seen better days. Just pick the one that looks pretty to you. Wash and cut off the stem right to the base, and about 1 to 1 1/2 inches down from the top, cutting off the upper, smaller and mostly tight leaves. Fill a large pot about 3/4 full of water. Add 1/2 C vermouth, 3 T olive oil, and a little salt. When the water is a rolling boil, place the artichokes in the water. Now, don't panic when you try and push them under the water. They will float so keeping them submerged won't be possible. Instead, just keep tongs around to kind of turn them over so that at least one side is under the water. Turn every 10 minutes or so. Boil on a low rolling boil, at about medium heat, (just enough to keep the bubbles up and intentional,) for 40-45 minutes. Chokes are done when you pull one of the bottom leaves off and it simply gives easily and comes right out. Take out of the water and invert to drain. Place on a plate and serve with good old mayo, drawn butter and grated fresh parmiggiano reggiano. I served it with a delicious Yalumba Viogner which brought out the sweetness of the choke and was great with the top notes of savory butter and green ymminess! I adapted this recipe and found it to be very easy. The steps are deceiving and may make you think it's not worth it. But the end result is delicious and works for so many things. Try it, and become a proud COMMON COOK! Cut tops and bottoms off of the orange and score the orange into quarters, cutting down only into the peel and not into the fruit. Peel the skin and pith of the orange in large pieces, use the orange for another recipe. Cut the peel into strips about 1/4-inch wide. 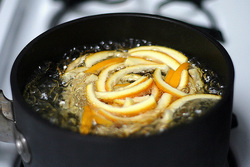 Put the orange peel in a large saucepan with cold water to cover, bring to a boil over high heat. Then pour off the water. Repeat 1 or 2 more times depending up how assertive you want the orange peels to be. (Test kitchen liked the texture of a 3 time blanch best, it also mellowed the bitterness. But it is a matter of preference.) Remove the orange peels from the pan. Whisk the sugar with 1 1/2 cups water. 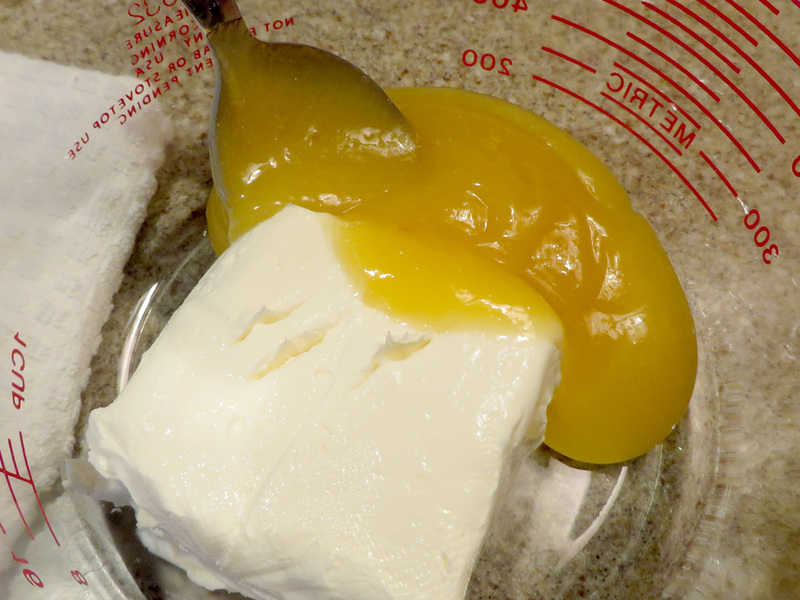 Bring to a simmer and cook for 8 to 9 minutes (If you took the sugar's temperature with a candy thermometer it would be at the soft thread stage, 230 to 234 degrees F.) Add the peels and simmer gently, reducing heat to retain a simmer. Cook until the peels get translucent, about 45 minutes. Resist the urge to stir the peels or you may introduce sugar crystals into the syrup. If necessary, swirl the pan to move the peels around. Drain the peels, (save the syrup for ice tea.) Roll the peels in sugar and dry on a rack, for 4 to 5 hours. Return to the sugar to store. Cook's Note: One way to use orange peels is to stuff a dried date with a piece of orange peel and almond, then dip the entire thing into dark chocolate.